The World Health Organisation has adopted new hygiene guidelines to fight the spread of Ebola –with support from the University of Brighton. The guidelines are the result of advice from experts from around the world, led by Professor Huw Taylor, the University of Brighton’s Professor of Microbial Ecology. He headed an international panel of experts to help develop emergency guidelines using the latest research from the university’s School of Environment and Technology. Professor Taylor said: “We received excellent feedback from the WHO on the advice we provided. 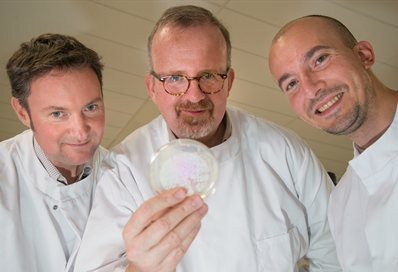 Our Environment and Public Health Research Group has been developing low-cost ways to disinfect human waste following disease outbreaks and the fact that the potential of these methods is now recognised by the WHO is testimony to the team’s excellent research, hard work and commitment. Professor Taylor thanked colleagues, particularly postgraduate researcher Emanuele Sozzi, who ran laboratory experiments in Brighton to test methods for disinfecting human waste at Ebola treatment centres. The new guidelines will help people working with Ebola victims to reduce the risk of the disease spreading in healthcare settings by better sanitary practice. Professor Taylor gave an outline of his work to a Parliamentary and Scientific Committee at Westminster and the work of his research group is having an impact around the world. Next week (7 Dec) he and colleagues Dr James Ebdon and Dr Sarah Purnell will be in Vellore, India, working with the Christian Medical College on a Gates Foundation-funded research project ‘Sanipath’. As well as laboratory work at the medical school they will be out in the city looking at pollution pathways with Indian colleagues. The same team, along with the university’s Dr Brian Jones, will be in São Paulo, Brazil, at the beginning of February to run a British Council-funded week-long workshop in collaboration with the São Paulo State Environment Agency.